The Akan people are a historically important ethnic group of West Africa. With over 20 million members the Akans are one of the biggest ethnic groups in West Africa today. 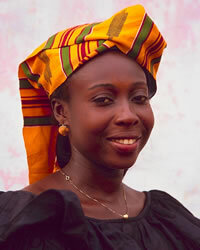 The Akan are the largest ethnic group in both Ghana and the Ivory Coast. They also reside in Togo. They speak Twi Fante. They are subdivided into several other people groups inclusing the Asante (Ashanti), the Bono, and the Fante. Each one of these groups share a common language, heritage, and culture that go back at least 700 years. Akan cultural ideas are expressed in proverbs and stories, as well as embedded into designs such as symbols used in carvings and on clothes. The most prominent aspect of Akan religion is an ancestor cult which serves to enforce tribal unity and morality. Other religious practices are based on belief in a supreme deity who created the universe and in lesser deities and spirits. Many Akan are now Christians. Pray that God will awaken the hearts of Akan in North America to things spiritual. Ask God to send evangelical Christians to become friends with Akan and through word and deed reveal an alternative lifestyle that is filled with a living relationship with Jesus Christ. Entreat the Lord Jesus to help Akans understand and receive the message of hope through Jesus Christ.